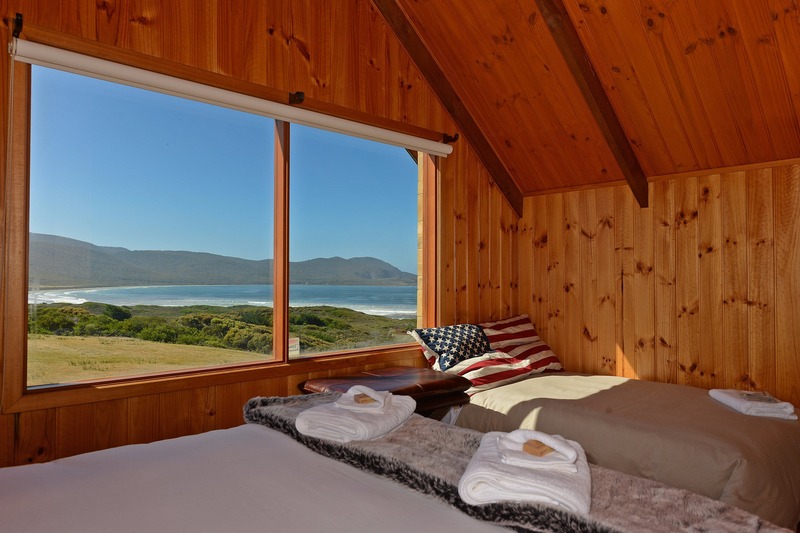 Cloudy Bay Villa offers visitors a unique experience on secluded south Bruny Island. This spectacular two-story house on a gentle rise over Whalebone Point offers some of the best views in Tasmania. Families, couples or small groups will find this light-filled beach house cosy, comfortable and welcoming. The view dominates both upstairs and downstairs, with multiple living areas and a sheltered outdoor deck on the first floor. Downstairs, an open, well-appointed and modern kitchen looks out to an expansive dining and living area with a huge dining table – clearly the focus of long dinners, sharing stories about the day’s activities. Afterwards, retire to the leather couches in front of the gas log fire. Each of the three bedrooms are comfortably appointed, with queen beds, their own ensuite bathrooms and luxury linen. The timber lining and natural finishes throughout the Villa fit with the serenity of the natural surroundings. An outdoor dining setting at the front makes the most of the ocean view and the rolling, open grassland leading down to the beach. There is plenty of room here for outdoor activity – or reading to the sound of the distant surf.